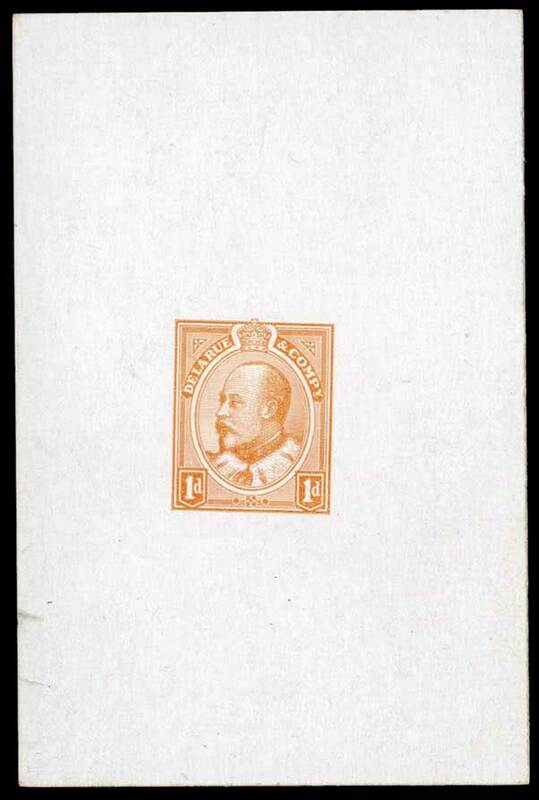 The 1c was issued to cover the postcard and printed matter rates. The 2c was issued primarily for the local one ounce rate, and the US rate. The 5c was issued to pay the surface rate to Europe and the UK. The 7c was issued to pay the registration and postage on local registered letters. The 10c was issued for use on parcels, to pay special delivery fees and for double weight UK and European letters. As there were still ample stocks of the 20c and 50c Diamond Jubilee stamps on hand at post offices, it was not considered necessary to replace these. It was decided to use up the existing stocks and then when these were exhausted to replace them with equivalent stamps in the new design. The 20c olive green was thus issued on September 27, 1904 and the 50c purple appeared in 1908 with the earliest known date of use being October 6, 1908. The stamps were engraved by Charles Skinner, who had engraved all the stamps since the 1897 Diamond Jubilee issue. They were printed by the American Bank Note Company in sheets of 200 divided into two panes of 100, or in some cases of the 1c and 2c, in sheets of 400 divided into four panes of 100. As we shall see this set although consisting of only a few stamps contains more than enough scope to challenge even the post patient and wealthy collector for decades. The leading student of this issue was George C. Marler, who published a book in 1975 titled "The Edward VII Issue of Canada". So as you can see, the values up to the 10c are not especially scarce overall, with tens of millions of the 5c, 7c and 10c being issued and over a billion of the 1c and 2c. However, the 20c and 50c are very scarce. To put the issue quantities in perspective, there are 726 2c stamps for every 20c and 4,575 2c stamps for every 50c stamp issued. What you will find as you collect this issue is that the challenge lies in locating top quality: most stamps printed grade VG. The stamps pictured are all VF and in the top 1-2% of the existing population of stamps. So if you plan to specialize in this issue in all its aspects, you need to be broadminded about accepting all grades of quality because some material, like the experimental coil stamps simply do not exist in superb condition. I will briefly outline each of these below. All of the values of this issue exist with at least two shade varieties. In the case of the 50c, the purple colour is unstable and subject to fading, so very pale and dull shades are often faded stamps rather than legitimate shade varieties. Unitrade lists most of the shades and certainly covers the broad groups, but does not list some of the sub-shades within each group. I find their description of the shades somewhat problematic on the 1c and 2c because the greens on the 1c are mostly all dull to some extent, and the word "green" seems too simplistic. Similarly on the 2c I have seen very few if any stamps that can truly be called carmine: carmine is a bluish red. Most of the 2c stamps are shades of rose in my opinion. In my opinion there should be at least three shade groups for the 2c, 5c, 10c, and 20c. However the listings will prove to be an adequate level of detail for most collectors. Most of the shades do not warrant significant premiums in Unitrade with the exception of the 7c straw in used condition, which is worth significantly more than the other shades, owing to the fact that it was the last printing of the 7c. The 2c pair above is type 2 (explained below) and was issued in a quantity of 100,000 to the general public. A very large number of pairs survived, making it a very affordable variety. The 2c was also issued in type 1 pairs defaced with either a black or red line, and these also exist in gutter strips of 4. All of these imperforates except that shown above sell for over $1,000 each and as much as $2,500, so they are really for those who are focusing only on this issue. The plates used to print these stamps were made from soft steel and over time they cracked with heavy usage. The 1c and 2c are found with such cracks, though the other values have not been seen thus. These varieties show themselves by way of horizontal hairlines running across the design. Unfortunately I do not presently have an example I can show you, but the lines are quite prominent and clearly visible with the naked eye. They are highly sought after by specialists. The existence of two die types on the 2c value was general knowledge until Unitrade began to list them over 10 years ago. To tell the difference between the two look very carefully at the area right above the "DA" of Canada. What you are looking at is the inner horizontal frameline that intersects the outer oval frame. On type II there is no break in this line - it meets the oval frameline cleanly. On type I there is one or more vertical breaks in this line just before it meets the oval. It is very distinct once you have seen it once and generally you can spot it without a loupe if your vision is good. In used condition it is a premium stamp cataloging $1 in fine condition against the 20c value for the common type II. So if you have large quantities of used 2c stamps, it is definitely worth looking for. If you are interested in re-entries, retouches and misplaced entries then this issue is king. There is no other issue that has so many of these varieties to offer the specialist. The Small Queens come close, but really nothing rivals this issue. Most of the re-entries are found on values below 10c as the issue quantities of the higher values were generally not high enough to cause the plates to wear to the point where they would need to be re-entered. One of the reasons for the existence of so many re-entries and misplaced entries on this issue is the relatively low number of plates used to print the 1c-7c values. In contrast, the over 200 plates were used to print the 1c-3c Admiral stamps of the next series. Consequently, the plates were generally replaced before extensive re-entries were required on that issue, so there are relatively few re-entries. On this issue they were re-worked again and again, resulting in a very large number of re-entries. Generally speaking the areas of the design to watch for are the corners and the letters. Unitrade does not list any of these in detail, choosing to list only major re-entries on the 1c, 5c and 7c, as well as misplaced entries on the 2c and a prominent "portcullis" retouch on the 5c in which the cross-hatching between "Canada" and "Postage" has been noticeably strengthened. These are generally only priced either in used condition, on cover, or not at all. Arguably, all re-entries are worth at least a small premium, but most are not really worth more than $5-10 in used condition as they are relatively common. All the values except the 50c exist with handstamped specimen overprints as shown above. They are all scarcer than the issued stamps as they were only produced for member nations of the Universal Postal Union. However, they are specialized items that are only in limited demand and so Unitrade lists them for between $125-$250 depending on condition. Essays of the basic design exist printed by Thomas De La Rue, who were not ultimately selected to produce the issue as shown above in several different colours. These are all very rare with only two examples of each known and selling for well over $1,500 each when they come up for sale at auction. There are also a large number of essays in the issued design, printed on different papers in various colours. Some of these were produced by the printer, while others were prepared by another well known printing firm: Perkins Bacon Co. Again, they are all very rare selling for over $2,500 each when they come up for sale. Finally there exist large die proofs on card, smaller stamp sized die proofs, and trial colour proofs for each value in the set. All of these are rare and sell in a similar price range to the material above, with the large sunken die proofs bringing close to $10,000 at auction. I reckon you could spend over $100,000 on acquiring all this material, that is if it all comes up for sale in your lifetime. A stitch watermark variety is now listed by Unitrade for the 2c, though in theory it could exist on every value. A stitch watermark is a series of parallel horizontal or vertical lines resulting from where the paper ream was joined to another ream. These joins are very infrequent and involve massive rolls of paper so the chances of them occurring on a particular stamp are infinitesimally small. In recent years though with the availability of large numbers of used stamps these types of varieties have been discovered occasionally by specialists who are carefully examining the stamps for varieties. They are highly sought after and generally sell for hundreds of dollars each, even in less then fine condition. This issue has the distinction of being the first to begin experimenting with machine dispensed stamps called coils. They are different from today's coils in the sense that they were not sold in rolls over the post office counter - this didn't come until much later on. Although the subsequent Admiral issue was the first to feature issued coil stamps dispensed by machine, the experiments that explored methods of separation, methods of gripping and advancing the stamps along the roll and methods of joining the rolls started with this issue. The above pair is an example of such an experimental item which was produced by taking an imperforate pair, cutting V shaped notches in the sides between the stamps and perforating between the stamps. The notches were intended to allow the machines to advance the stamps and also provide a way to separate the stamps without tearing them. Ultimately there would be more experiments in the Admiral issue and none of the experimental formats in this issue were ultimately adopted. 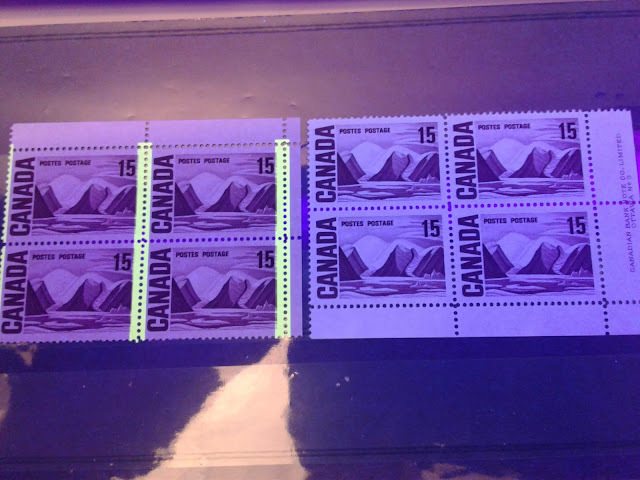 But they are an important aspect to this issue and are in demand from coil specialists as they are the forerunners to all Canadian coil stamps. This issue continued the trend started by the Numeral issue with the 2c value being issued in booklets containing two panes of 6 for 25c. The cover design was identical to the Numeral issue: the Canadian coat of arms. The booklets are very rare and panes from these booklets are very expensive. Even singles from booklets catalogue between $6-$10 each, so these provide another reason to go through those large bundleware lots of used 2c stamps, as many have not been picked out yet, since the booklet stamps were not listed and priced until about 20 years ago. The rarest and priciest item of this issue is an imperforate tete-beche pair of booklet panes. It lists for $28,000 in the 2016 Unitrade catalogue. Please note that "styles" refers to the overall appearance of the cancel, not the numerals or the town names. This is why there are thousands of possible varieties - because one style will exist in several different towns or numerals. In addition there are inverted, double and double one inverted varieties as well. Some of these varieties are very rare and valuable. For more information you are encouraged to consult the Wallburn "Canada Precancel Catalogue", which lists most all of the known varieties. As with all early Canada, these issues can be found with a wide variety of CDS cancels, many being from towns that no longer exist or from post offices that have closed. Many of them sell for as much as $50 per cancel where they are identified with a rarity factor, but many can still be found in unsorted used lots. There are a number of handbooks by various authors that list the post offices of different provinces and assign rarity factors to the cancels. A number of pre-printed postcards, letter cards, post bands and wrappers were produced for this issue that bear pre-printed stamp impressions. I will detail these in a subsequent post, but suffice to say here that this is another highly specialized field and the premier expert on this material was a philatelist by the name of Webb, who produced a specialized postal stationery catalogue. Another distinction that this issue has is that it falls into the period in which postcards became popular as a form of communication. While postcards are known from the 1890's, it is really the Edwardian period that is the Golden Age of the postcard. Many very high quality postcards such as the Thanksgiving card shown above were printed in Germany and by Tucks in the UK, and many are relatively common and inexpensive. Some themes are scarce and expensive as well. But the collecting of these cards is yet another fascinating sideline to this issue that can provide many hours of enjoyment to the specialist. An added advantage is that you can source this material at most antique stores - something that you cannot do with very many issues other than the Admiral issue. Postal history is a very specialized and challenging field on this issue once you get beyond the basic 1c, 2c, 5c and 7c covers. The 10c, 20c and 50c are very rare on cover, with single usages of the 50c cataloging $2,000 in 2016 Unitrade. There are really three aspects to this issue that require vast amounts of wealth to complete. We've already looked at two of them: the imperforates and the proofs. Large plate multiples such as that shown above are the third aspect. It is doubtful that it is even possible to acquire a multiple for every printing order made, but it is certainly a worthwhile challenge on which to embark if you have very deep pockets and a lot of patience. The above scan shows a block of the 7c from plate 2 and as you can see there are a large number of stroked out numbers to the right of the plate number and one set not stroked out. These are the order numbers and they show that plate 2 was re-used several times for different print orders. It is likely that the re-entering of the worn plates occurred between the printing orders. You see this also with the early printings of the Admirals, but not the later ones in which the post office simply used a new plate for each printing order. So there you have my overview of this issue. My next post will deal with the shade varieties on this issue.